Just three months after opening our super kitchen in Brisbane, FareShare achieved a milestone which took us 13 years in Melbourne. On January 24, we cooked more than 5,000 nutritious meals in a single day. A combination of skilled chefs, 320 willing volunteers, high-volume cooking equipment and a continuous supply of fresh food have been the key ingredients to success. 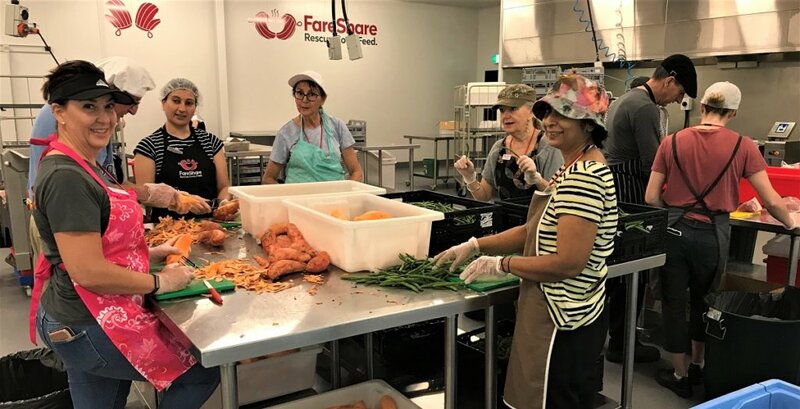 “From day one, everything we learned in Melbourne has been invaluable,” said FareShare’s Queensland director Kellie Watson. “We hit the ground running. “The quality of fresh food from Foodbank is excellent. We have a large amount of protein, particularly chicken, and more sweet potatoes than we can poke a stick at! Earlier this month, the Brisbane kitchen sent 1075 cooked meals up to Townsville to support the flood relief effort with PFD Foods supplying free transport for the 16 hour journey. The kitchen has also showed itself to be nimble in coping with seasonal gluts. In November, Kellie’s team cooked 10 pallets of tomatoes into passata – the perfect base for many of our meals. The new corporate volunteering program has opened to rave reviews and is taking bookings for an impactful team building experience. And most importantly, the vulnerable people we cook for are loving our nutritious meals. Find out what they had to say.